It looks like Hyundai Malaysia will be displaying the all-new Hyundai Santa Fe this week at the Kuala Lumpur International Motor Show (KLIMS 2018). The company changed the cover photo on its Facebook page, clearly showing the sleek new headlights of the fourth-generation SUV. Let’s do a quick recap. In terms of design, the seven-seat Santa Fe takes after the Kona, sporting a more rugged look that’s fronted by slim LED DRLs (Hyundai’s new identity for its SUVs) and a large Cascading Grille. The main beams are LED (projector units) and are built below the DRLs. The Santa Fe’s profile is highlighted by a strong shoulder line that stretches from the headlights to the tail lights, and the near-flat roofline gives off a familiar silhouette as its predecessor. At the back, it gets a pair of LED tail lights with unique checkered C-shaped graphics. Inside, the cabin is completely redesigned and takes after the Kona as well. It features a three-tiered dashboard, with a freestanding seven-inch infotainment display positioned up top, followed by slim air vents, dual-zone climate control and a Qi wireless charging tray below. Rearward visibility is improved thanks to the larger rear quarter glass (41% bigger than before). The longer wheelbase (2,765 mm, 65 mm longer) also means that there’s more legroom for passengers in the second and third row. In the second row, legroom is up by 38 mm and the seat is 18 mm higher. There’s a new one-touch seat folding function for easy access to the third row seats – headroom back there is up by 22 mm. To recap, the seven-seat SUV made its world debut earlier this year, and there are up to six engines (four petrol and two diesel units) available on offer. It starts with the 2.0 T-GDI petrol turbo (232 hp, for Korea), 2.0 GDI, 2.4 MPI and 3.3 MPI naturally-aspirated petrol units, whereas the diesel range is comprised of the 2.0 litre and 2.2 litre CRDi turbodiesel engines. 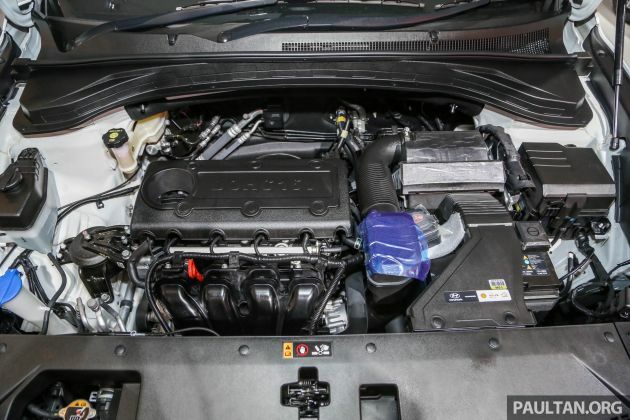 It’s unclear which engines we will get, but the 2.2 litre turbodiesel (making an estimated 200 hp and 434 Nm of torque) and 2.4 litre MPI petrol are potential candidates. All engines are mated to an eight-speed automatic transmission that’s developed in-house, which Hyundai says is lighter than the older six-speeder despite having two extra ratios. Drive is sent to all four wheels (Hyundai’s HTRAC all-wheel drive system) with electronic variable torque-split clutch with active torque control between the front and rear axles. Four drive modes are available (Eco, Normal, Sport and Smart) – in Sport, up to 50% of torque is distributed to the rear wheels. In comfort mode, about 35% is sent to the back, but in eco mode, power is primarily sent to the front wheels for optimal fuel efficiency. Other upgrades include a more responsive steering, new suspension setup that improves vehicle stability, comfort, NVH and overall quietness, more extensive use of sound deadening materials as well as the optional self-load-levelling suspension that continuously adjusts ride height regardless of vehicle load. For safety, it gets a head-up display for the first time, Hyundai SmartSense active safety and driving assistance features which bundles Blind-Spot Collision Warning, Forward Collision-Avoidance Assist with pedestrian detection, Rear Cross-Traffic Collision-Avoidance Assist, Lane Keeping Assist, Rear Occupant Alert, Safety Exit Assist and Speed Limit Info Function. As with all Hyundai models, the Santa Fe boasts extensive application of high-tensile strength steel – in fact it features more high-strength steel than any other Hyundai vehicle with 57%, or 15% more than the older model. Also standard are six airbags. Interested? Be sure to see the vehicle in person at the Malaysia International Trade and Exhibition Centre (MITEC) from November 23 to December 2. Same priced as class rival Mazda CX9 circa RM300K. Have a look at new santa fe at KLIMS 18..
Dissapointed to note malaysian spec without third row air cond..